Attack 1 : ARE U READY 4 FREDDY? Flip a coin. If heads, the opponent loses all power and loses 200 HP. Flip a coin. 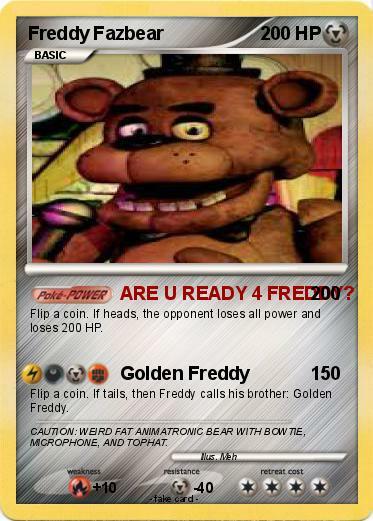 If tails, then Freddy calls his brother: Golden Freddy. Comments : CAUTION: WEIRD FAT ANIMATRONIC BEAR WITH BOWTIE, MICROPHONE, AND TOPHAT.